A remarkable sight greets you on the rolling, fynbos-covered sand dunes of Keurboomstrand, north of Plettenberg Bay in South Africa. Some liken the pristine white organically shaped building to a space station, others to a ship. Architect Silvio Rech, who designed the remarkable form with Lesley Carstens and Donald Takura Changwa, who was in charge of the technical drawings, says, “It looks as if it has been eroded like a piece of whalebone on the beach.” He also suggests that from certain angles, you might discern the forms or motion of a pair of swimming whales. “It has the feeling of an organic object or being,” he adds. The building is something of a contradiction: it stops people in their tracks, yet its plastic, wavelike form is remarkably unobtrusive and sensitive to its surroundings. Dubbed K Cottage (although at three storeys high, it’s substantially bigger than a cottage), it is the holiday home of South African-born, UK-based investor Julian Treger. The building is something of a contradiction: it stops people in their tracks, yet its plastic, wavelike form is remarkably unobtrusive and sensitive to its surroundings. Treger is also a prominent collector of design and art, and is passionate about architecture. Although he says he originally considered a super-minimalist design, his mind turned to “organic architecture given the undulating nature of the hills, and the mountain behind, and the wave motion of the sea”. At the same time, because he is interested in the history and DNA of the designs he loves, the architecture was also to be an exploration of the roots and development of organic architecture. 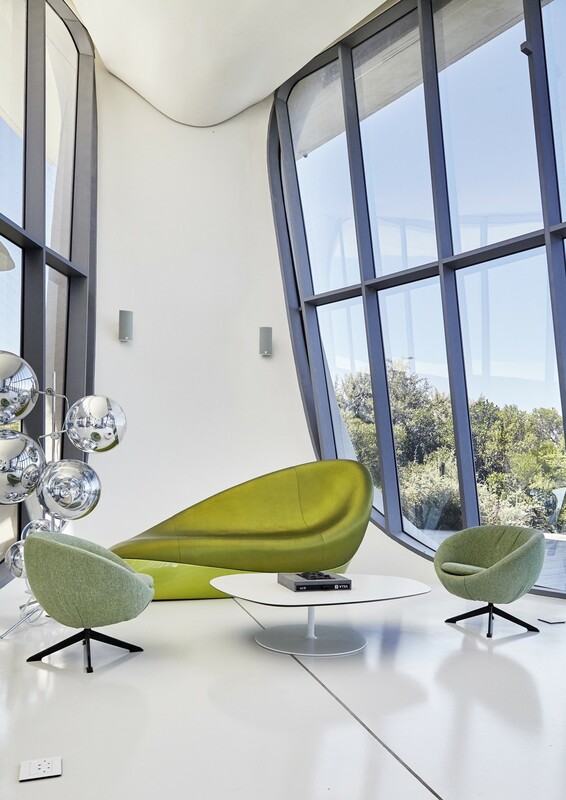 Treger and the architects found themselves exploring the futuristic art and architecture of the sixties, taking in designs such as Brazilian modernist architect Oscar Niemeyer’s 1968 design for Villa Mondadori in Cap-Ferrat, France; Eero Saarinen’s early ’60s TWA Flight Centre at JFK Airport, and John Lautner’s futuristic California homes, with more than a nod to the more recent organic architecture of Zaha Hadid. “It was a bit of a love letter to the architects of that era,”says Rech. Rech and Carstens are well known as architects of some of the best and most luxurious lodges and island resorts in Africa and around the world. They have refined their approach to architecture as a mediator between man and nature, but have also pushed the envelope of the art of architecture as experience, as an adventure in itself, and integral to the experience of nature. They brought that philosophy to bear in their design for K Cottage. 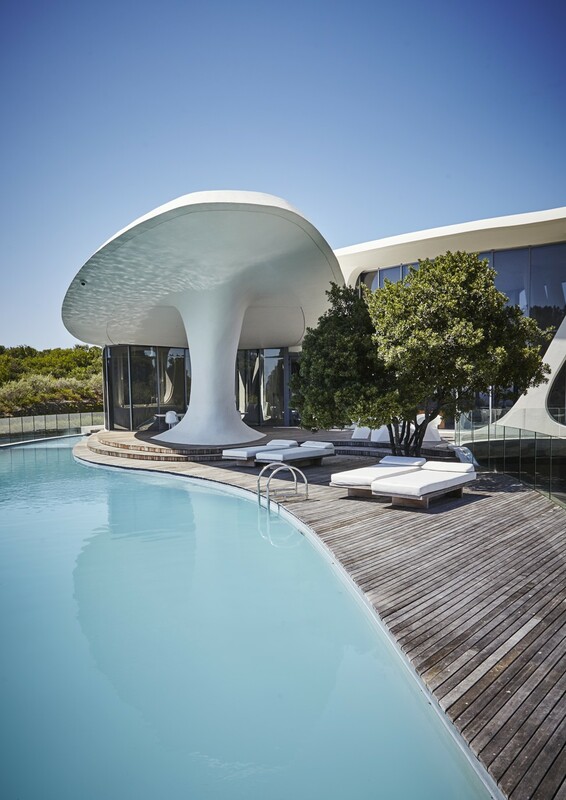 First of all, just as the weather and light is constantly changing in Plettenberg Bay – Rech refers to the famous “four seasons in one day” typical of the climate there – he and Carstens designed a kind of dynamism into the forms of the building. “You sense that this building is ever moving, and it’s just frozen at the moment you see it,” says Rech. “As you move away, you almost feel as if it is about to rise and swell and move.” The sense of motion it evokes is part of what prevents it from imposing on the landscape. Rech adds that it has views from 360 degrees around. While the vast glass curtains in some areas provide as pure and unmediated views as is possible, at certain points the glass seems to slip behind what Rech calls “a kind of exoskeleton”. The building becomes more a “drum-like skin that is punctured in various places”. “The punctures correlate very specifically to what is happening on the inside,” he adds. For example, from the bathroom, there’s an oval opening above the bath that focuses the eye on a specific view over a lake where Treger keeps a lakeside office. The other purpose of the house is to function as a gallery for a selection of pieces from Treger’s collection of furniture and art. “I have hundreds of pieces of furniture in my collection,” says Treger. He selected pieces that were “appropriate to the architecture” and reflected some sort of organic design, entering into a dialogue with the architecture. “Most of it is mid-century modernism,” he says. But he’s selected work by the Brazilian Campana Brothers, for example, because of the beach-like organic feel of their materials. 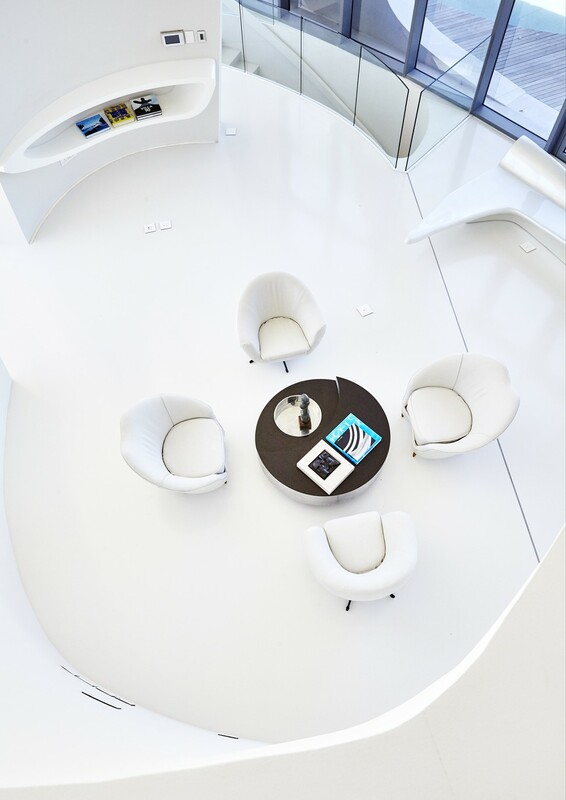 A number of bespoke pieces, some of them almost extensions of the architecture, were designed by the architects, including a number of the tables, counters shelves and cabinets. “They were built into the walls, as if parts of the architecture just morphed out,” says Rech. 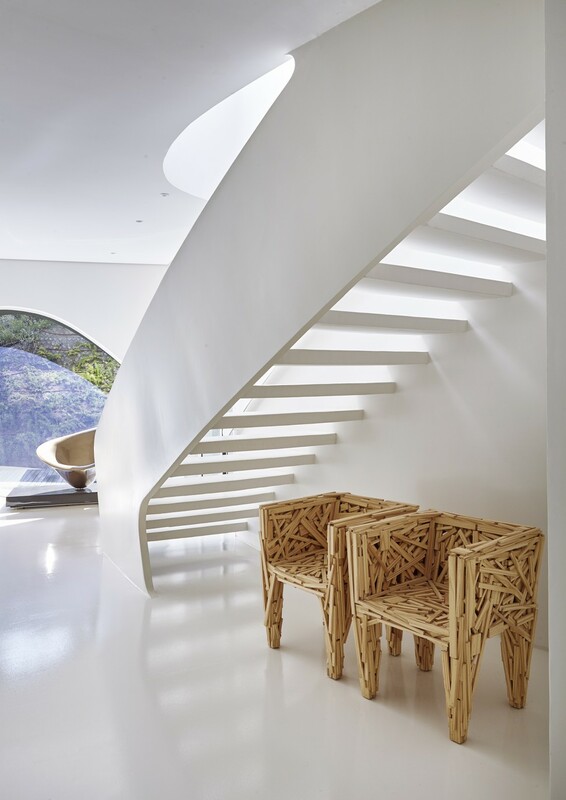 The white-on-white interior, very much a descendent of Kubrick’s sets for 2001: A Space Odyssey, captures the light while forming a neutral, restful backdrop for the contents of the house, and its views. 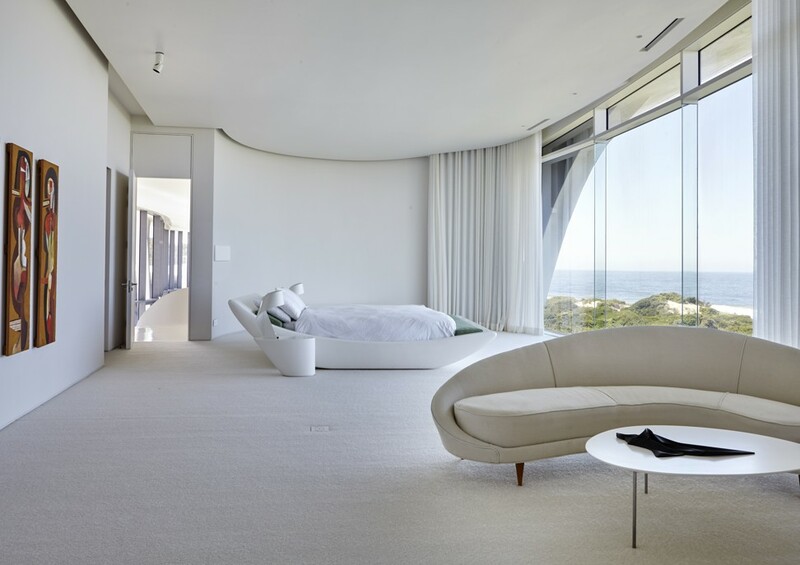 He notes that it adds a simplicity to the space, which is appropriate for a beachside home.